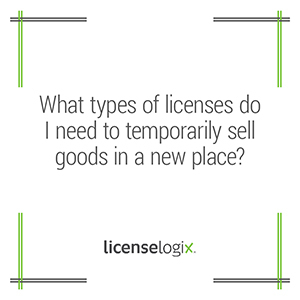 What types of licenses do I need to temporarily sell goods in a new place? LicenseLogix can help with all your business licensing needs! (800) 292-0909 Even if the business will only be operating for one day, they may still be subject to licensure. Common types of licenses include transient vendor, itinerant merchant, temporary sales tax permit and basic business license. Generally, all licenses must be held prior to the start of operation in the new jurisdiction. Each state defines a transient merchant a little differently and requires different licenses for such activities. West Virginia defines a transient vendor as “any person (individual, partnership or corporation) who does not maintain a residence or place of business in the State, but who brings property into the State to sell to consumers.” Illinois defines a transient merchant as any “person who is engaged temporarily in the retail sale of goods, wares or merchandise in this State and who, for the purpose of conducting such business, occupies any building, room, vehicle, structure of any kind, or vacant lot.” Other variations exist which limit the applicability to the type of goods sold or expand the license requirement to all businesses that make any income in the state, however temporarily. Some states require a merchant to obtain a temporary or transient sales tax permit. According to the New York Department of Taxation, if you expect to make taxable sales in New York State for no more than two consecutive sales tax quarters in any 12-month period, you may apply for a temporary Certificate of Authority. In Utah, All vendors participating in special events are required to obtain a Temporary Sales Tax License and Special Return from the Utah State Tax Commission. Other states require a transient vendor/merchant license. Sometimes they are administered and issued by the state Attorney General or Department of Consumer Affairs, and sometimes they are issued on the county or city level. Common application requirements include proof of foreign qualification, surety bond, and detailed business descriptions. Some applications require an inventory of goods to be sold and a complete listing of employees who will work in the jurisdiction. These licenses are often issued for one year, however, sometimes they are issued for shorter periods of time to cover only limited temporary activities. Transient merchants must also be aware of all other local license requirement such as basic business licenses, privilege tax licenses, registration with local police departments, and any applicable zoning and special events permits. LicenseLogix will help merchants determine the licenses that they need and obtain all of the licenses and registrations required, minimizing time-consuming and costly delays. For additional help, you can fill in the form on the right or give us a call at (800) 292-0909.